Honeycomb Alternative! Acer's tablet presence has so far been fairly restrained, but is beginning to gain more and more traction with every new model. 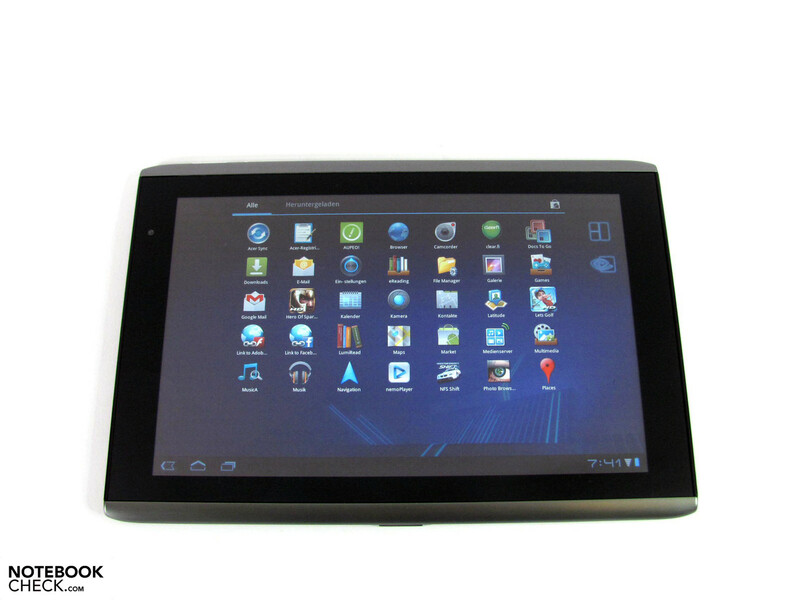 The Iconia Tab A500 offers an Nvidia Tegra 250 multi-core CPU/GPU, 32 GB of memory, a high resolution WXGA display, and the brand new Android 3.0 operating system. 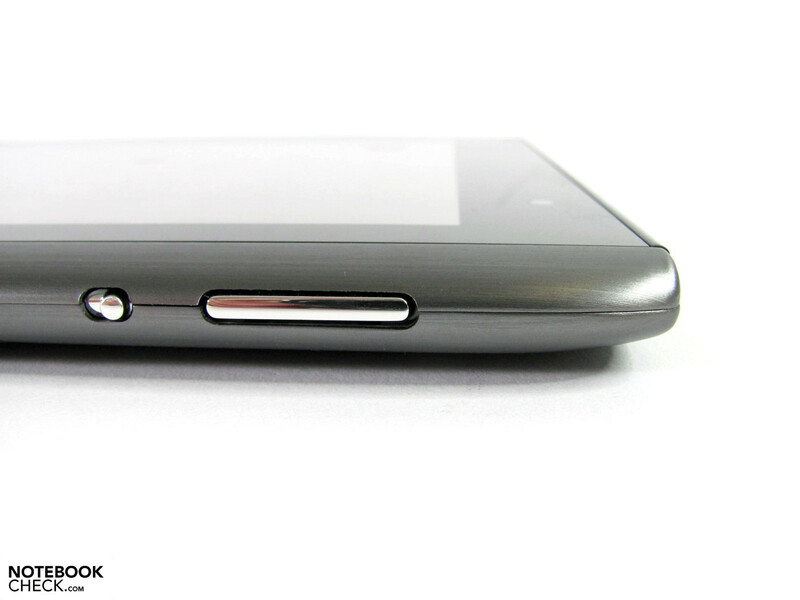 What can be expected from the slim 500 Euro device was tested by us. 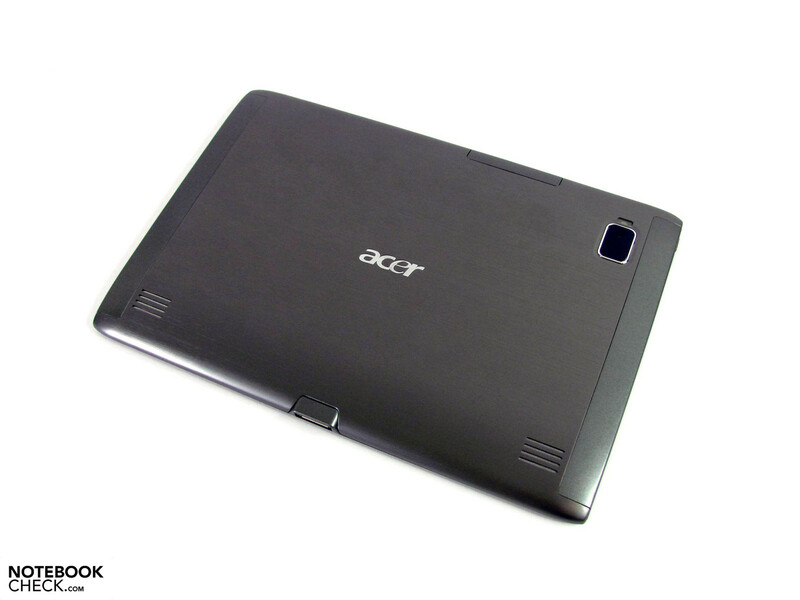 As with the netbooks, Acer appears to be approaching the booming market for tablets in a relatively casual manner. While several manufacturers have already experienced some flops with their quick releases, Acer has taken its time. This can actually only be good for the quality of the products, since this can provide for a good basis, whereby it is possible to learn from the mistakes of others. Since a few weeks there are now two new interesting devices in Acer's portfolio. 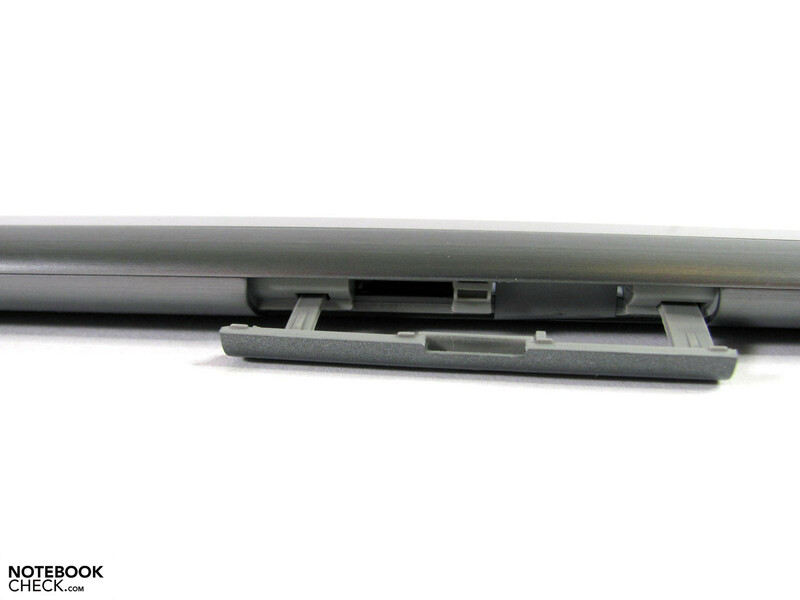 The Iconia Tab W500, which runs Windows 7, AMD-Fusion, and an interesting docking concept. And the Iconia Tab A500 in our review, which despite of the similar name, is equipped with an Nvidia Tegra 250 and runs the new Android 3.0, and thus ventures an entirely different way. Our tested model is currently available from about 490 Euros, and thus only lies a fraction below the RRP of 499 Euros. 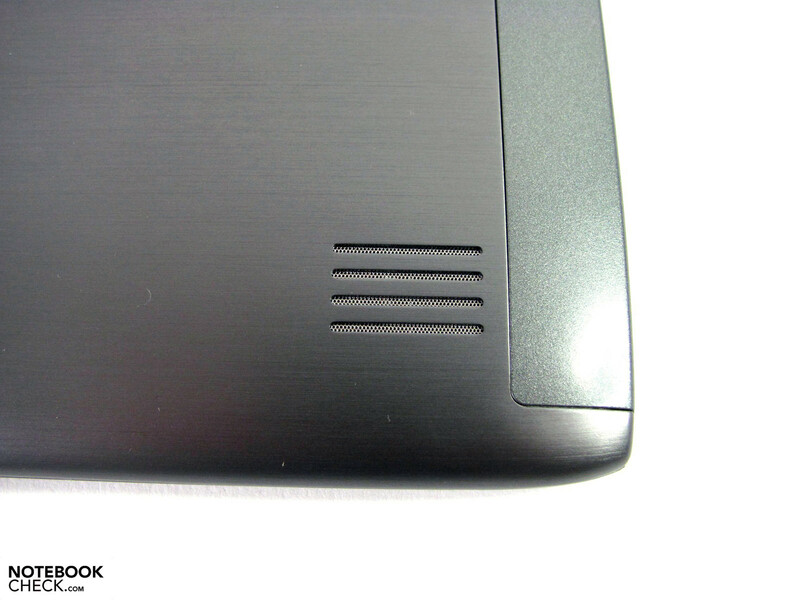 The case of the Iconia Tab A500 has stylish similarities with the Iconia Tab W500. The aluminum look on the back, chrome colored operating buttons, and the large black display frame with the WXGA display. The rigidity of the case is very good, the materials are solid, and the robustness of the surfaces is in line with the usual sensitive standard thanks to the glossy display. What's not so convincing is the precision of manufacturing. This may only become apparent when looking in detail, but the badly aligned components are certainly not beautiful. The iPad makes a generally high quality and robust impression in this case, thanks to the unibody case and the glass display surface. The big advantage of our tested candidate compared to the previously tested W500, is the lighter weight of 750g, which is almost 200g less. Holding this without support is possible for a relatively long time, whereby the lightness of the iPad 2 with 601g is not quite reached. The AC adapter is also very light with a further 120g, and can also be tucked away neatly thanks to the removable plug. More on the theme of cases can be read in our comparison of different tablets. The available interfaces barely provide the standard sizes, but instead require micro-variants. 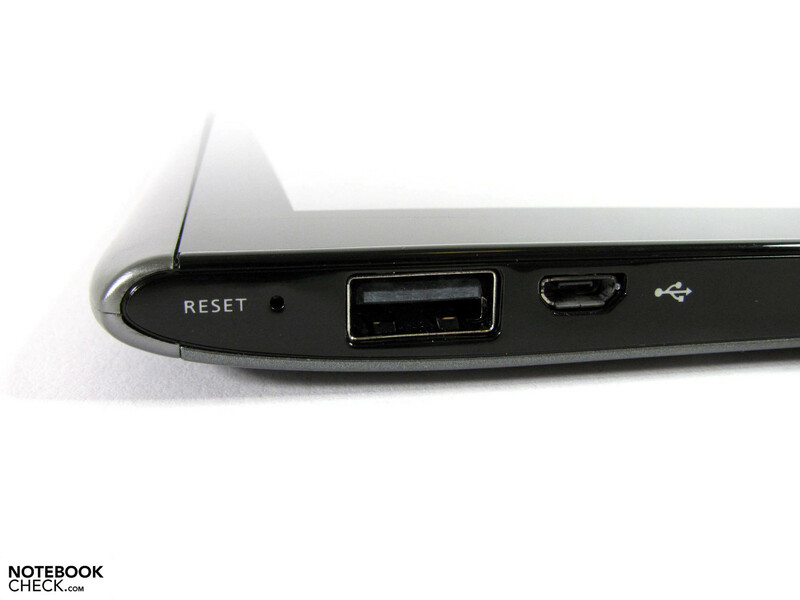 A regular USB 2.0 port is the exception to this. Otherwise there are Micro-USB (for connecting a hard drive to a PC for faster data transfer), Micro-HDMI, and a MicroSD card slot. Included in the delivery is merely a special USB cable, HDMI will have to be acquired separately. The important interfaces are located on the sides, and are easy to reach, with the exception of the Micro-SD slot with its fiddly cover. The latter of these appears to be more suitable for a permanent memory expansion in any case, since the swapping of the small memory cards can become very fiddly due to the difficult to reach slots. The transfer of data is therefore better carried out via a cable or a USB stick. We were able to transfer pictures, videos, and music without problems using a USB stick, or data transfer cable from a PC and from an external hard drive. Even videos could be played back directly from a USB stick. A simultaneous use of both of the USB ports is only possible with narrow USB cables, since the distance between the two is very close at 3 mm. The big disadvantage of Android and iOs compared to Windows tablets, is the missing usability of common USB peripheral devices, such as DVB-T sticks, DVD drives, or UMTS sticks. In these cases it is either necessary to resort to expensive specialty solutions, such as for example Equinux` tizi DVB-T or WLAN hotspot for iOs, or to completely omit these options. What is also not exactly ideal is the long reaction time of 5s when switching on and off, which is not possible with the usual short press. Changing this setting is also not possible. For wireless communications there are WLAN 802.11 b/g/n and Bluetooth 2.1+ EDR available. An additional GPS module supports the usual locating services. Variants of the A500 with UMTS are currently not available, however, should be offered soon as with the W500. 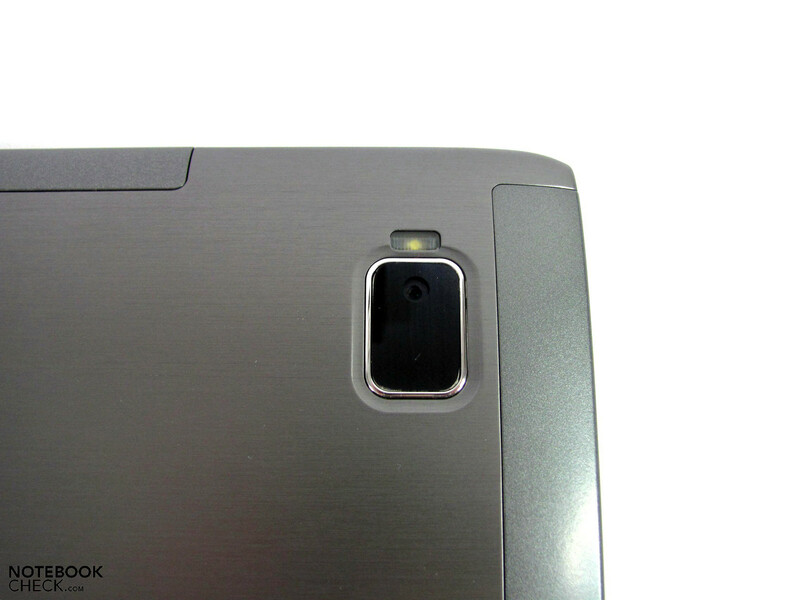 The Iconia Tab A500 has 2 cameras, just like most smartphones and in the meantime also the iPad. 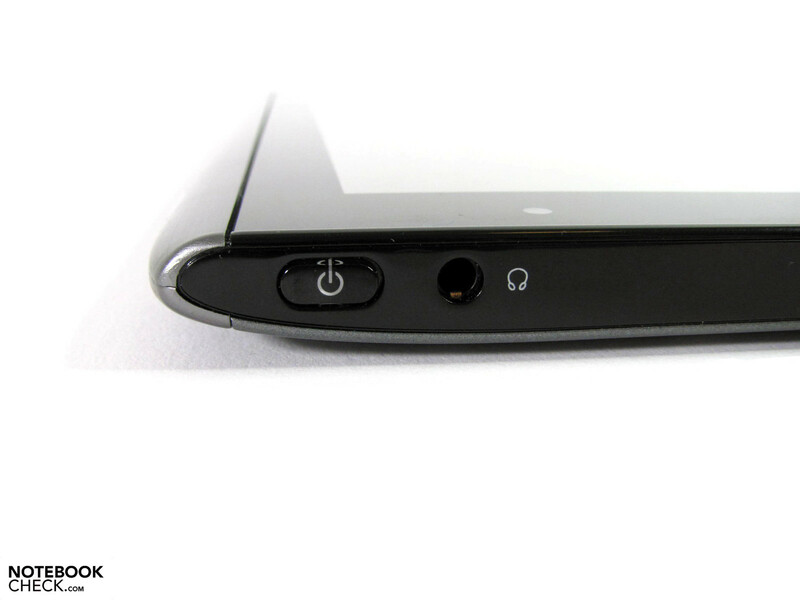 One 2 MP front camera for video telephony, and one 5 MP camera with autofocus and flash on the back for taking pictures. 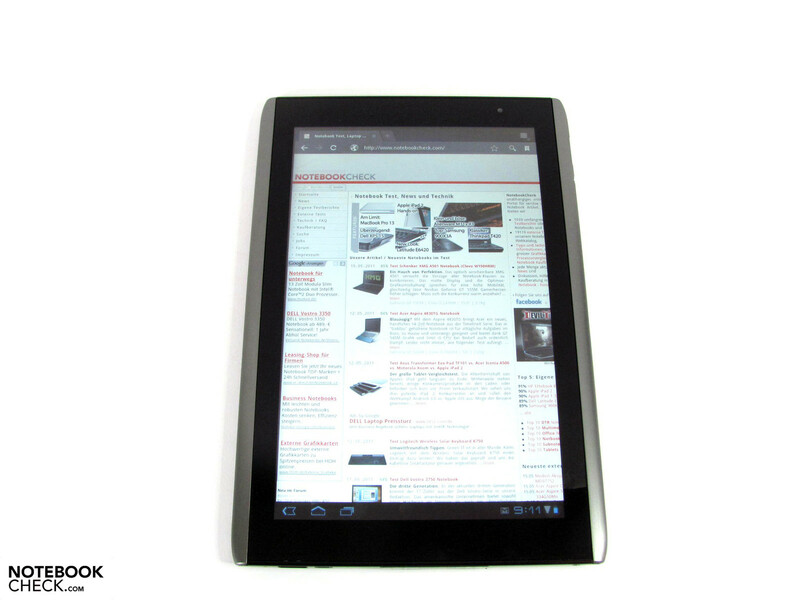 A comprehensive evaluation with a comparison to the competition can be found in our tablet comparison test. 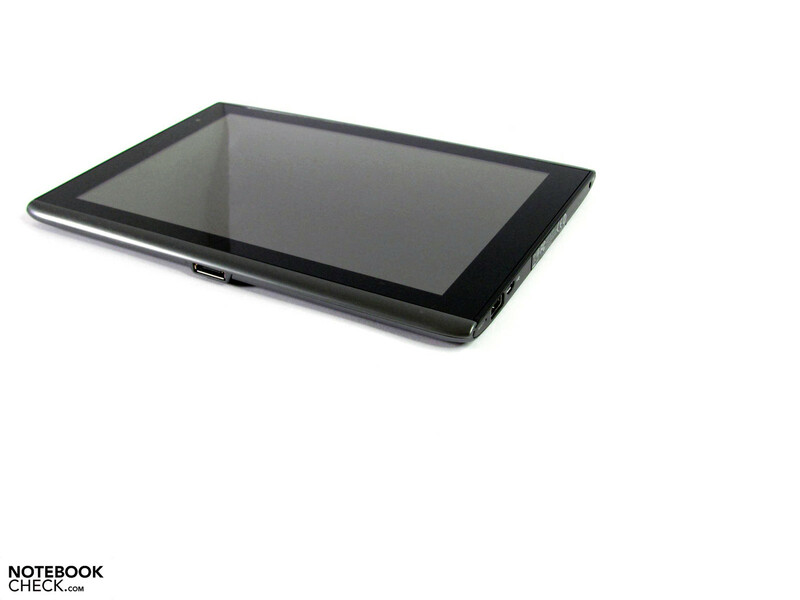 The accessories for the Iconia Tab A500 are easy to oversee. These primarily include a docking station with a remote control (LC.DCK0A.001) for about 70 Euros, and a special protective case which functions as a holder (LC.BAG0A.011) for about 35 Euros. 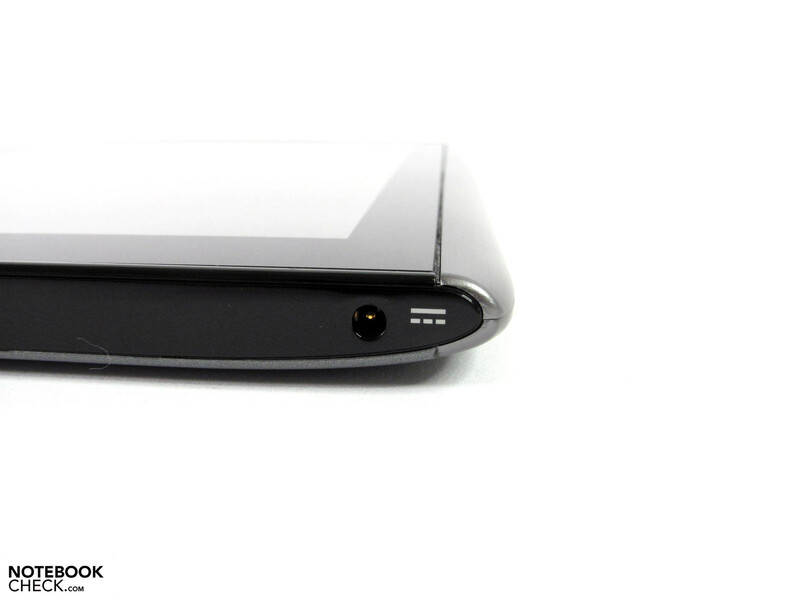 The docking station provides a charge function, as well as an audio output, and a remote control although this is a matter of preference. The manufacturer's warranty lasts for 1 year, and can be extended via different bolt on packages. It is for example possible to extend the warranty to 3 years bring-in + 1 year international travel insurance for 79 Euros, and 3 years bring-in + 3 years accident cover + 3 years international travel insurance for 99 Euros. 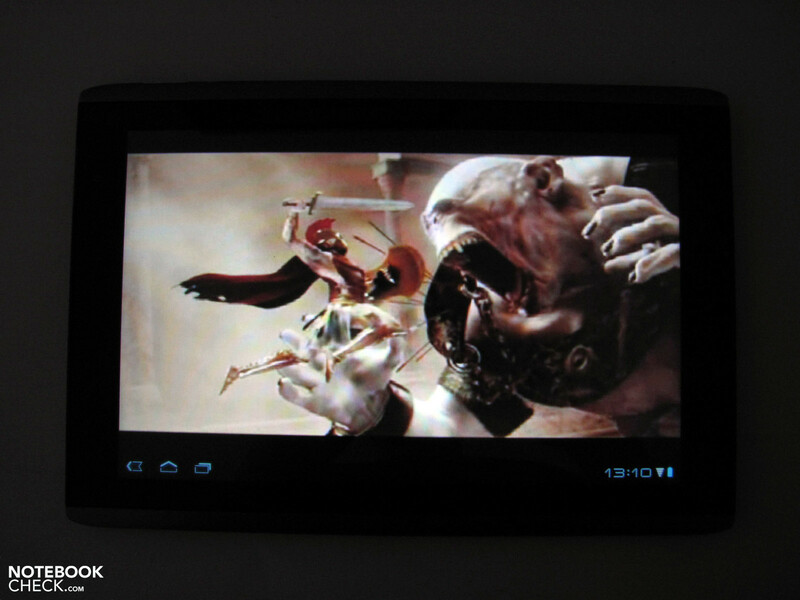 The multi-touch screen reacts well and accurately to commands from a finger. Control using a pen is not intended as with the Iconia Tab W500. 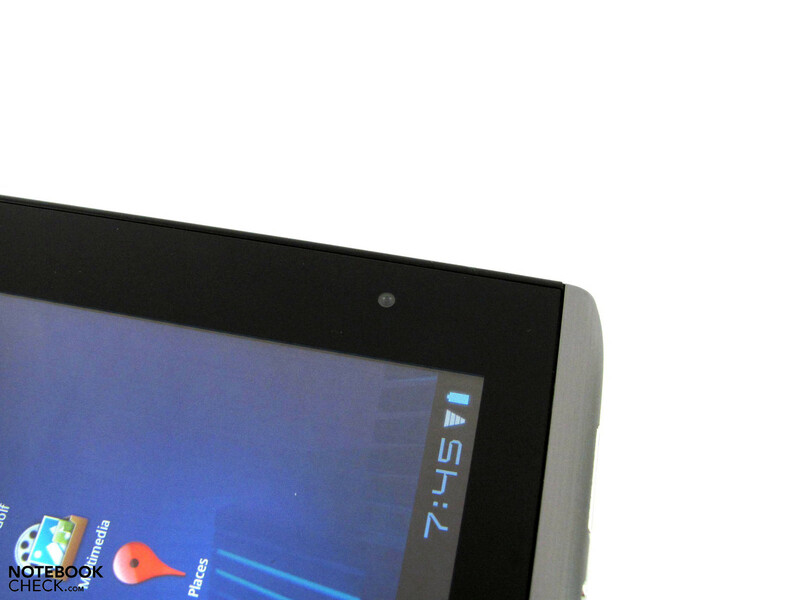 The navigation around the Android 3.0 surfaces is smooth, and apps open quickly. Using different themes for screens it is possible to organize the apps as wished. Important operating functions, such as the zooming of pictures using a double-click or by using two fingers works perfectly. The rotating of pictures in comparison doesn't work. The surface of the display has good traction properties and makes a robust impression, but is also very reflective. From time to time users should check the settings for apps that are no longer needed that may be running in the background. Should these become too many, then the reaction times become noticeably slower as a result. The virtual keyboard is actually quite big, and more or less comparable with that of the iPad. Users won't have to plan for a lengthy familiarization since the operation is intuitive and in line with expectations. Even longer emails can easily be written with it, although it doesn't come close to the conventional keyboard of a notebook. Frequent typists will unlikely find much gratification. At least for stationary use it is also possible to attach an external keyboard via USB or Bluetooth in order to solve this issue. We tested this with a Microsoft USB keyboard, and were able to use this immediately. When clicking in a text field the virtual keyboard no longer opens in favor of external entry. A comprehensive evaluation of the virtual keyboard can be found in our comparison test. Since the first installment of Android tablets that we had for review last year, there is a clearly noticeable improvement when it comes to the display qualities. Although there are still hardly any devices with a non-reflective display, the other characteristics are definitely worthy of praise. 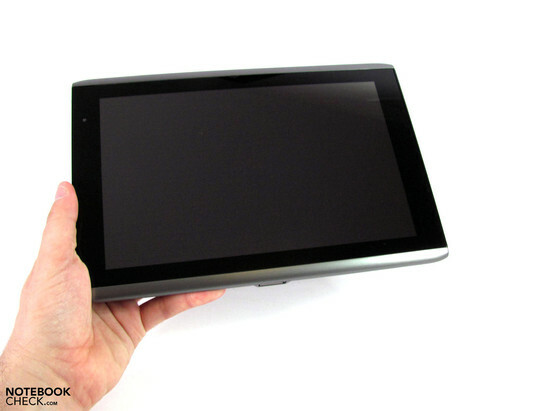 Acer has included a 10.1" display in the Android Tab A500, as with the Windows model Iconia Tab W500. This also has a smooth and reflective surface, although the display frame is not quite as wide. The resolution is 1280x800 pixels, with an aspect ratio of 16:10. Thus there is more room horizontally and vertically compared to the iPad. The backlight provides a maximum of 305 cd/m², which is not quite as much as the current tablet competition, but still a significant improvement compared to the "first generation". Together with the other 8 measurement points, the illumination lies at 79%, whereby 275 cd/m² are reached on average. The latter of which is more than enough for use indoors, and is strong enough to trump most reflections on the display surface. The uneven illumination is more than anything else the result of a reduction of brightness of more than 60 cd/m² from the left upper edge to the right bottom edge. When looking in detail this may not only be visible with monochrome backgrounds, but doesn't play a big role in practice in our opinion. For outdoor use the illumination is no longer sufficient in order to trump the reflections, causing these to become a limiting factor. In this case users will have to find a place in the shade, and sit with the right orientation to prevent surroundings appearing on the display as much as possible. Other competitors, including the iPad, have to contend with the same issues however, and due to the lack of alternatives with a matte display these have to be accepted. The contrast ratio lies at over 1000:1, and thus provides very crisp colors for pictures, videos, and games. 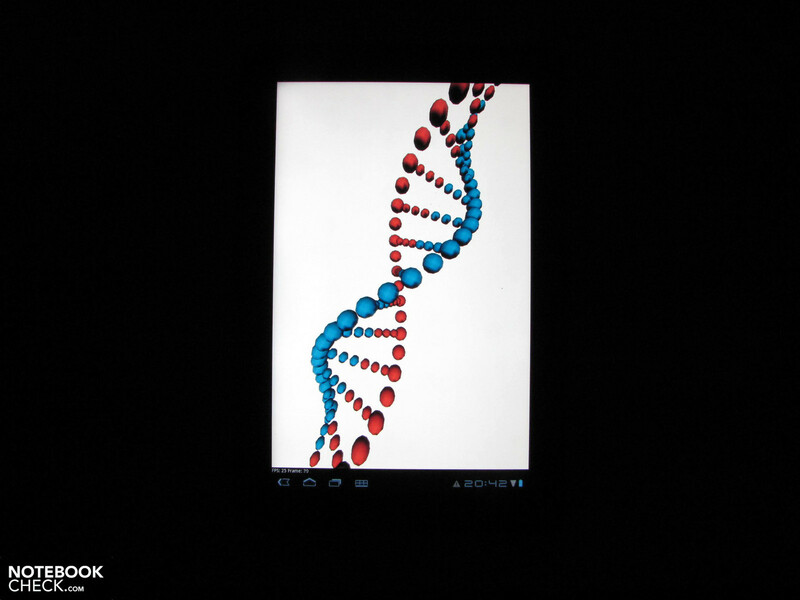 Deep blacks are otherwise seldom seen (exception AMOLED, see review of the Nexus S Smartphone). 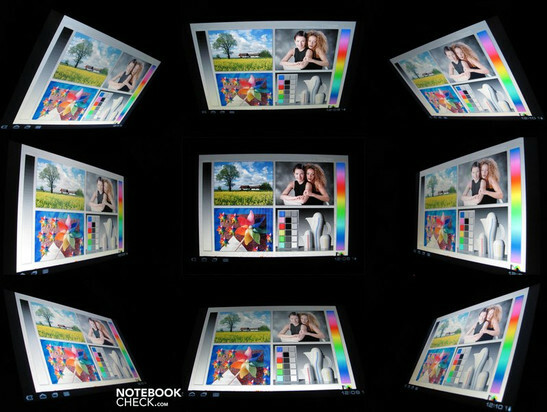 What is surprising is that a display like this has made it into a 500 Euro product, while more expensive notebooks in the business and consumer domain often only provide dull images. At least manufacturers seem to have changed their thinking when it comes to tablets, something that will hopefully also transfer into the notebook space. What is also surprisingly good is the viewing angle stability. Images are visible from all angles, as they should be with a tablet. There is also no excessive color inversion or dulling of colors either. Merely smaller color and brightness changes are discernible, depending on how the display is being held. The color measurements couldn't be completed due to a lack of Android support for our colorimeter. As with the Toshiba Folio 100, Nvidia's multi-core processor Tegra 250 is used. Along with 2 (main) processing cores, there are also additional cores for all the special tasks. Underneath the processor there is also Nvidia's Gefore ULP, which is responsible for the graphics processing. 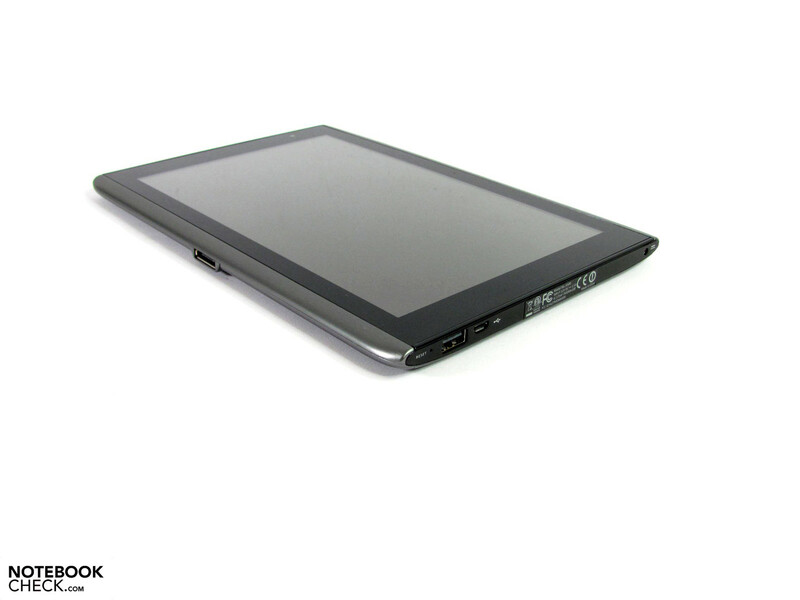 With 1 GB of DDR2 RAM, and a 32 GB capacity flash memory chip, these are the primary components in the Acer Iconia Tab A500. The upgrade possibilities are merely an additional 32 GB with the appropriate MicroSD card. With Sunspider the Acer Iconia A500 was able to propel itself to the top of the table of all the Android and iOs devices we have tested previously with 1908ms. The Quadrant benchmark was completed by the tested device with 2087 points, which is also the top score. In this case comparisons are only possible with other Android devices however. The GLBenchmark 2.0 primarily assesses the 3D graphics performance, and has different test scenarios for this in its repertoire. We used the first 4 test elements, two with and two without FSAA. 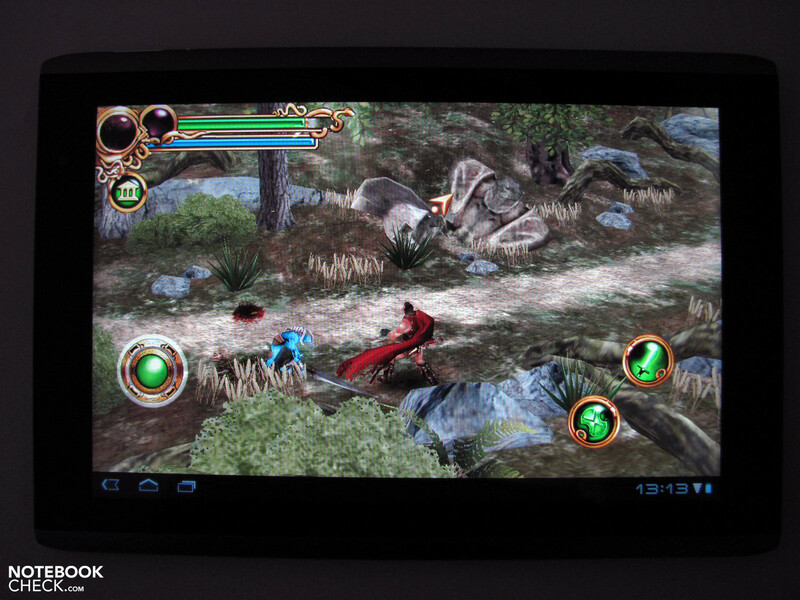 In this case the Iconia Tab A500 with its Tegra 250 scores 10.8 and 26.1 fps, which is significantly less than the Folio 100 and the LG Optimus Speed. The reason for this is the considerably higher display resolution of the Acer, which has a negative impact on the test results with otherwise more or less identical hardware. 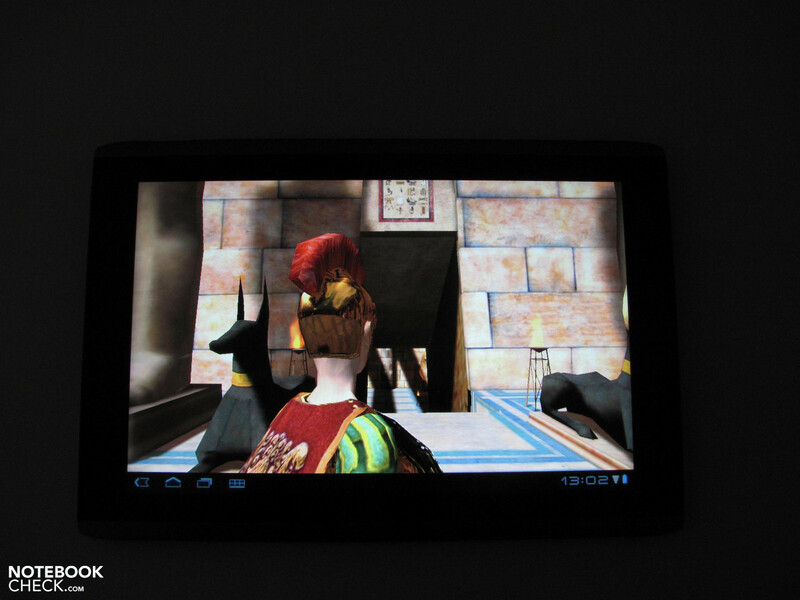 Our usual 1080p test videos couldn't be played back by the Acer Iconia A500. This will only be possible following a software update in June according to the manufacturer. What's funny is that the Toshibas Folio 100 with similar hardware, and the old Android 2.2, could already do this last year. 720p videos and lower resolutions play back perfectly though, and are the more ideal formats for the WXGA display resolution. Only users that will want to use the tablet as a video source for high definition displays and televisions, will have to wait a few more weeks. Flash is not pre-installed, can be manually installed easily though, with a link to the Android market on the desktop. Flash content from a news website was smoothly played following the installation. Android can so far only offer a few decent games. 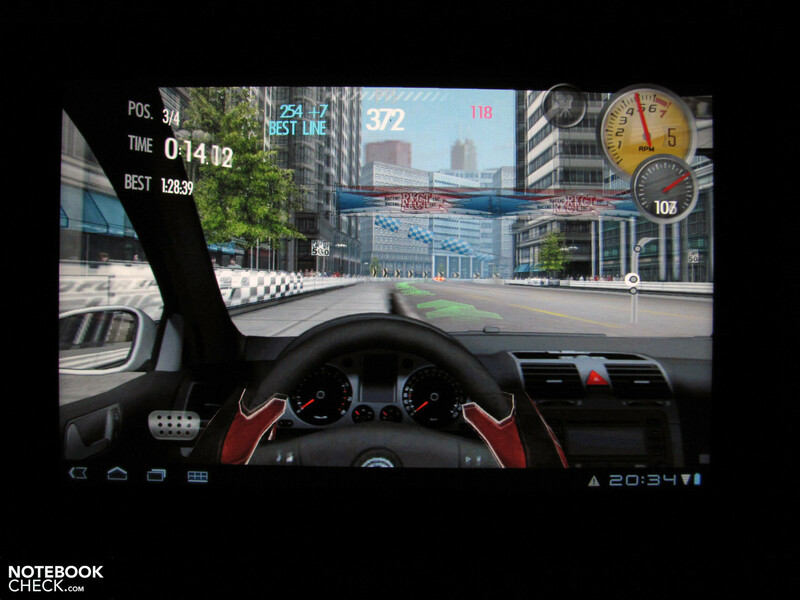 Gaming highlights such as Real Racing HD, Galaxy on Fire 2, or Dungeon 2 HD, which are a lot of fun on the iPad and fully utilize the hardware, are not or at least not yet available for Android devices. More and more this area is expanding for the Android market, but in comparison to the iPad, users will usually have to wait several months for the release. There are some promising games to be found in the Tegra area, and there are for example test versions of Hero of Sparta and Need for Speed Shift installed on the Iconia, which give a good insight into the performance of the system. We were unable to find any performance shortcomings in these cases, and both of the games ran smoothly and without judders in the test. During normal use the tested device stayed cool despite the absence of an active cooling system. The system noise was silent. In cases when using hardware intensive games for longer periods of time, the heat dissipation can however be felt on the back of the device. Possible limitations aren't likely to arise as a result of this though. The audio output is also not well balanced, as with many other mobile devices, and suffers from a concentration of high frequencies, which leads to a lack of mid frequency and bass response. Simple USB speakers and USB headphones weren't tested, although a headset with a mini jack immediately worked without problems. The battery life of the tablet can theoretically last for over 10 hours (642 minutes). In this scenario only the minimum brightness is available though, and the system cannot be utilized more than is necessary for reading text documents. In order to carry out the test with our Reader script, we also had the WLAN module activated for the internet connection. Without WLAN we would have therefore been able to extend the battery life for a few minutes more. Increasing the display brightness for the same test to maximum leads to a considerable reduction of the battery life to 332 minutes (5.5 hours). 720p videos were played back from the internal memory for 275 minutes in this scenario (WLAN off, maximum brightness), and with a full load (3D games) the battery life lasted about 218 minutes (everything on, maximum brightness). Acer's Iconia Tab A500 is a solidly put together tablet, which considering its weight, adopted materials, and appearance, offers good basic features. The battery life is good, and will last between 3 and 6 hours in practice depending on the type of use. The operating comfort is also good, although it can be improved by hidden functions in the Android system or the addition of additional apps. What we really like is the display, which may have some shortcomings with respect to the illumination and due to the reflective surface, but otherwise impresses with a high contrast ratio and good viewing angle stability. Altogether the Acer Iconia Tab A500 with Android 3.0 can tackle many tasks well, but falls behind the iPad in many respects to a certain extent. This can unfortunately not always necessarily be made up for with the better selection of interfaces, and the somewhat more affordable price. Although whether or not this is the case obviously depends on personal preference and requirements, in any case the Iconia A500 is definitely an alternative. 5 MP camera with flash and autofocus. The speaker diaphragms on the back only provide mediocre sound quality. The front camera is not centrally aligned but on the side. The card reader slot is difficult and impractical to reach. The keys make a quality impression, what doesn't fit in with this impression are The unevenly aligned case elements. The On/Off switch needs 5s to react. 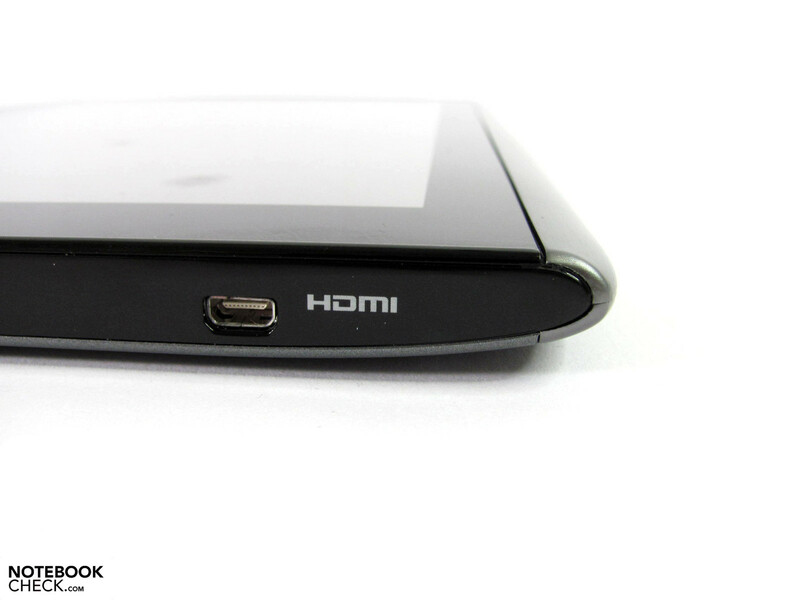 The Micro-HDMI port requires a special cable. 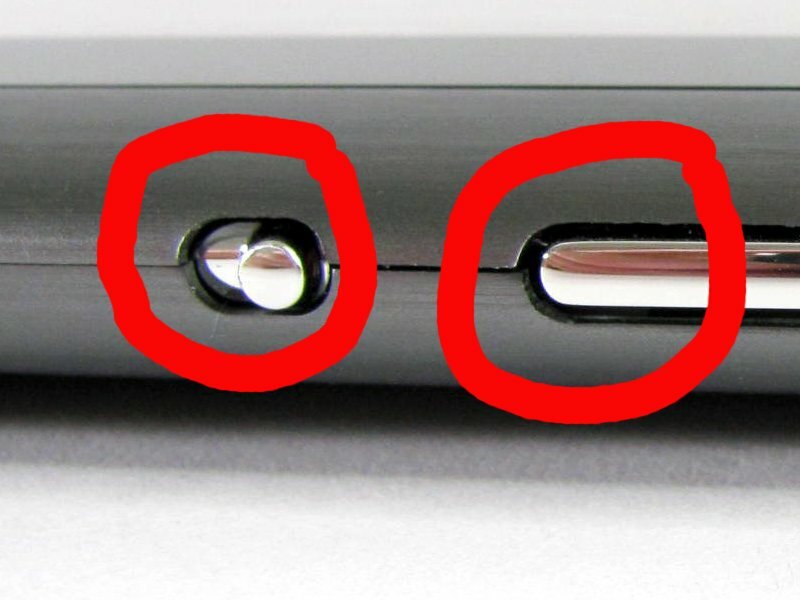 USB 2.0 and Micro USB are only separated by 3mm. The power connector is unfavorably far up, when the Iconia is standing. The WXGA resolution is bigger in the vertical as well as horizontal dimensions. 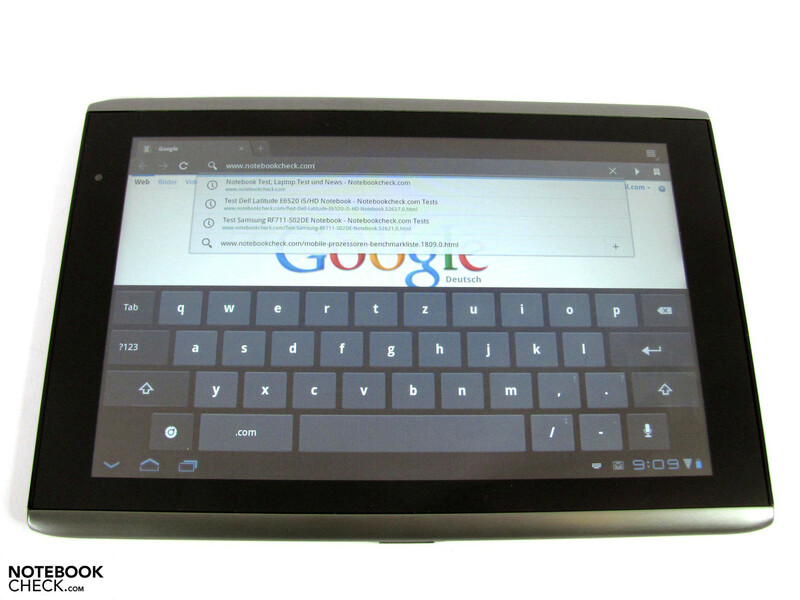 As with most other tablets, users will have to come to terms with a reflective display surface. is relatively flat and also lighter than the Windows Pendant W700 with 750g. 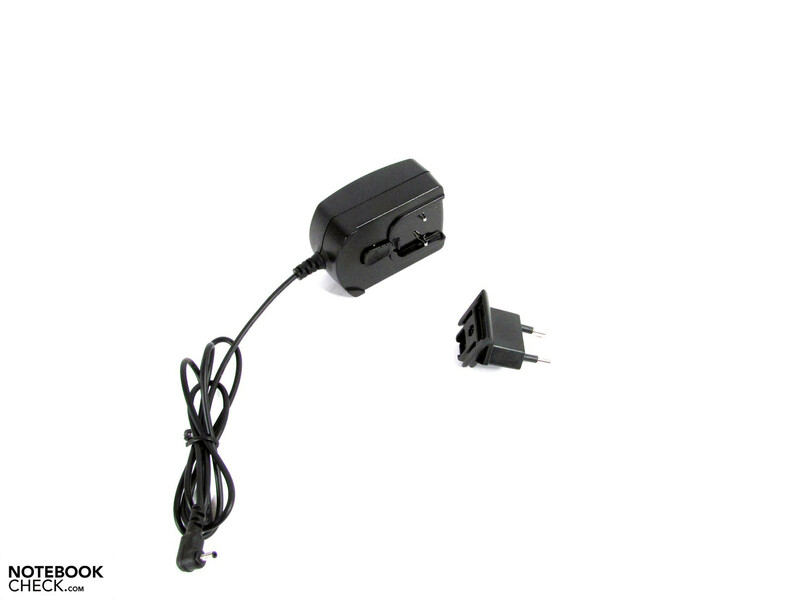 Small and easy to disassemble AC adapter. Good display, and a well balanced package for a relatively affordable price. A non-reflective display surface, 3G modem (should no longer be the case in future models), and more separation between USB ports. That Acer has only provided few functions for the A500 docking station. Can be found in masses in our TOP 10 tablets. Those that prefer smaller, should also take a closer look at the Samsungs Galaxy Tab, with which it is also possible to make phone calls.